John Fife: Rally - Big Cat in the forest? 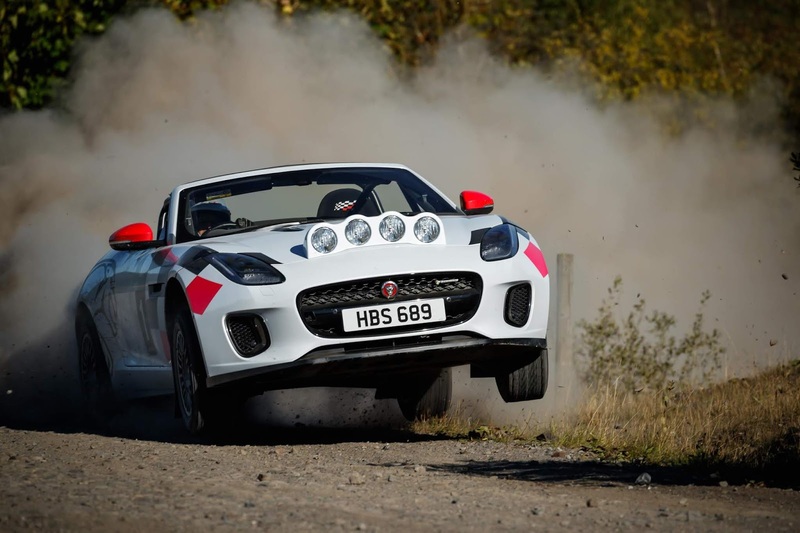 What started out as a homage to Jaguar's rally winning XK120 cars in the 1950s has resulted in the production of two current Jaguar F-TYPE rally cars, built in-house by Jaguar themselves. Sadly there are no plans to match the competition record of Ian Appleyard's Jaguar XK120 (NUB 120) which won three consecutive Alpine Rallies without incurring a single penalty point, and won the 1951Tulip and 1953 RAC rallies. Both rally-specification F-TYPEs are powered by Jaguar’s 300PS 2.0-litre Ingenium four-cylinder petrol engine. Jaguar Design and Engineering built both cars to FIA specification, with uprated brakes and suspension, rollcage, race-seats with six-point harness, bonnet-mounted light pod and fire extinguisher. The uprated grooved disc brakes feature four pot callipers while hand-built three-way adjustable competition dampers and softer springs have been designed to cope with gravel stages as opposed to tarmac events. The cars also have a limited-slip differential and a hydraulic handbrake! Perhaps more surprisingly this special rally derivative is available to order now with prices starting from £62,335 - that's half the price of an R5. But seriously, no-one in their right mind would seriously consider one of these for rallying - or would they? When you think of 'nutters' one name springs to mind. Remember Tony Worswick? The Blackburn based engineer entered the 1992 Tour of Mull Rally in his bright yellow Ferrari 308. Daft idea for an Italian thoroughbred. Or maybe not. Tony finished in 22nd place overall out of an entry of an entry of 121 cars and crews from all over the UK. What a memorable sight and sound that was. However, there was one drawback to using such a potent beast on the narrow island roads. The 8 long chrome air intakes on top of the 4 litre V8 protruding through the bodywork above the engine. When Tony was flat-out over Mishnish Lochs at umpteen thousand rpm, the intakes were sucking in sheep which had strayed too close to the road, and spectators had to hang on to small children! OK, I might have exaggerated that last bit, but if Ferrari can do it, why not Jaguar?